We all know I have this problem with bananas. They ripen up faster than I can eat them! I, again, found myself with three super ripe bananas that I needed to do something with. And honestly, I had more bananas in the freezer as is than I really should have. So, I ran out and grabbed a small container of yogurt and set out to make a banana nut muffin my parents really like. 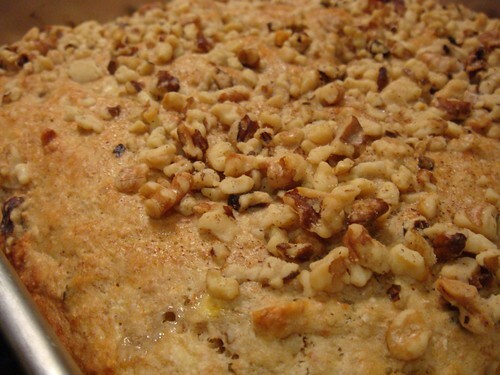 This recipe is from Americas Test Kitchen: Family Baking Book. I really like their Family Cookbook and many of the recipes found in the Baking Book are also found in the Cookbook. There is nothing truly authentic in there, just very easy to make versions. I like it as a reference book as well as a cookbook. 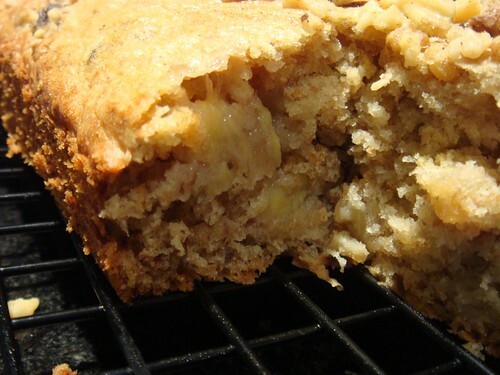 This recipe is based on their Banana Bread. When I make it, I usually just portion it off into a muffin tin and just make 12 muffins instead of one loaf. Two reasons. First, it’s portioned so no knife needed for each individual’s interpretation of how large a slice should be. Second, it bakes in 20 minutes as opposed to an hour+. However, when I finally made it home to make these muffins, I found I did not have my muffin tin. I thought I did, but I thought wrong. While staring wistfully at the loaf pan and wondering how much sleep I really needed to remain functional, I remembered my trusty 8×8. Since it would give more surface area for the batter, it wouldn’t take as long as a loaf, and only slightly longer than a muffin tin! My parents wouldn’t care what it looks like, as long as it was yummy. In the end it looked more like a snack cake than a bread, hence the snack bread. 6.5 tablespoons butter, browned and slightly cooled. Spoonful of sugar mixed with a little cinnamon to make some cinnamon sugar. Set oven to 350 degF and grease up an 8×8 pan with some of the browned butter (brushing is preferred, but a paper towel does the job too. In a large bowl, whisk together the dry stuff: All purpose flour, whole wheat flour, sugar, baking soda and salt. 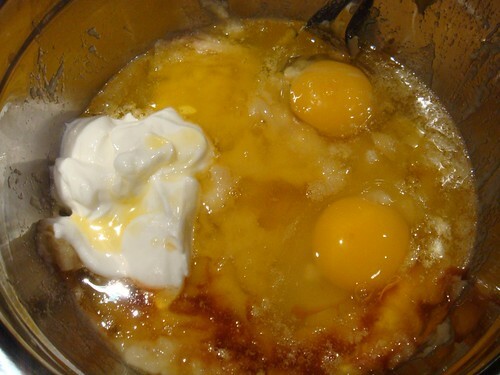 In a medium bowl, whisk together all the wet stuff: Mashed banana, browned butter, eggs, yogurt and vanilla. Pour the wet stuff into the dry stuff and gently fold the wet stuff in with the dry stuff. When it starts to look like it’s just coming together, throw in two handfuls of the walnuts and finished folding. 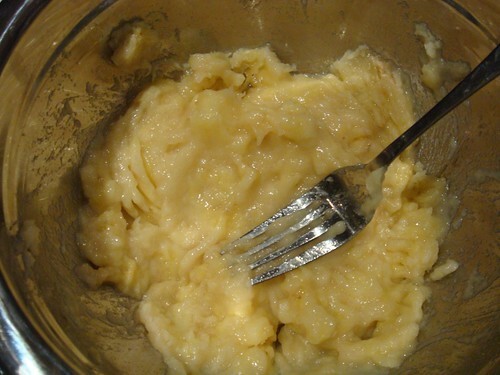 Don’t overmix, it should be clumpy and look just a touch floury. 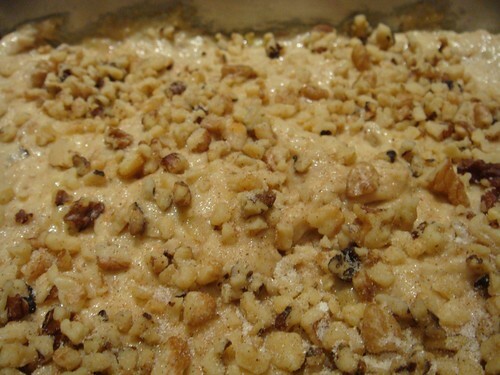 Pour it into the greased 8×8, top with the remaining walnuts and sprinkle on some cinnamon sugar to your liking. Into the oven it goes for about 30-35 minutes. Once a poke in the center comes out clean, it’s done. Let it sit in the pan, on a cooling rack until cool enough to handle, then carefully flip it out and let it cool, facing up, until you can break off a piece and enjoy it. Let it cool completely before packing. In the end, the bread was delicious, with lots of banana running throughout. It was also nice and moist. The use of greek yogurt over regular plain made no difference (less sugar, more protein in Greek yogurt!) The browned butter made a noticeable difference, and you can taste it on the edges of the bread due to greasing the pan with it also. Next time I would add a touch more sugar, only because my bananas, while being ripe, weren’t black. Maybe more cinnamon sugar topping!